On February 14th each year, many people exchange cards, gifts or flowers with their special “valentine.” The day of romance we call Valentine’s Day is named for a Christian martyr and dates back to the 5th century, but has origins in the Roman holiday Lupercalia. To make send flowers to Hanoi on Valentine’s Day, we would like to suggest best flowers in Hanoi Flower Shop. Sample the best Valentine’s Day roses, boxed flowers, bouquets and long roses from Roses Only – one of Florist Hanoi. Come with us, ensure your friend, husband, wife, partner or just that someone special know you are thinking of them on this Valentine’s Day. Nothing says “You are my only one” like a single red rose, while a dozen long roses shouts “I will always love you. Be my Valentine today. A box of red roses is the perfect gift of romance. Their elegance and beauty sure they delight everyone who is lucky enough to receive them. We are always used red roses from Dalat, Ecuador. Flowers be always fresh, beauty and bigger. You should send valentine flowers with a card message, for example as humorous, witty, heartfelt or romantic. Read through our more tips for creating the best Valentine’s cards help set the mood and send the perfect message of love to accompany your flowers or gifts. People always choose roses, because only roses help you with the special Valentine’s Day, so you can treat your partner to a delicious meal that perfectly complements your flowers and gifts. Delight them with the perfect combination of flowers and romance. You are looking for more romantic ideas to help create the perfect Valentine’s Day? 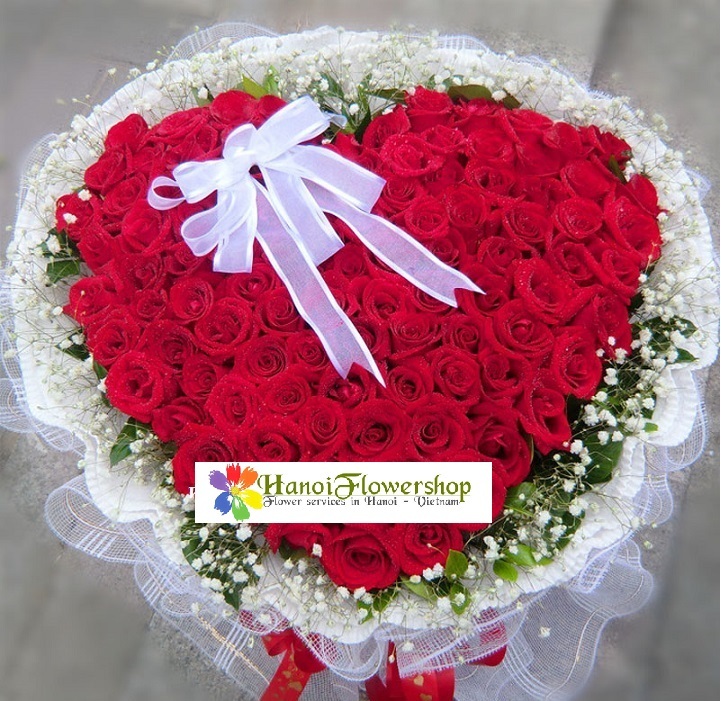 Please send email to us as soon as (email: sales@hanoiflowershop.com, hotline: +8497 3535 559), we will give you some suggest which our things to do on Valentine’s Day help you create one special date. Don’t worry about everything, Hanoi Flower Shop delivery valentine flowers to everywhere in Hanoi: Ba Dinh District, Hoan Kiem District, Dong Da District, Thanh Xuan District, Cau Giay District, Hoang Mai District, Hai Ba Trung District, Tay Ho District and some district on the outskirts. Order your Hanoi Valentine’s Day flowers now or before the 12th. Do not leave it too late, we cannot ensure deliver flowers in time. This entry was posted in Flowers to Hanoi, Send flowers to Hanoi, Valentines Day on January 29, 2016 by hanoiflowersshop.